ZENY Products presents the beautiful Outdoor Wicker Bar Stool Set. ★UV WEATHER-RESISTANT -- Featuring a powder-coated aluminum frame, this modern outdoor patio bar stool comes with an espresso brown synthetic rattan weave, with UV protection for years of outdoor use. It can ne left outside and no worry about weather. ★SUPERIOR COMFY -- Each stool has a 5cm thickness staple fiber cushions, which add more comfort for sitting. You can sitting on this stool for a whole day without feeling tried. 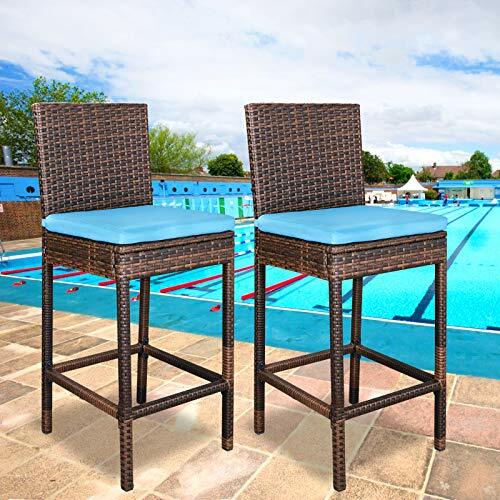 ★ DURABLE WICKER MATERIAL DESIGN -- This set of bar stools are constructed of durable wicker material, ensuring a set of stools that will still stand strong for many years. Perfect for Indoor, outdoor garden, park, patio, porch, poolside and yard. ★EASY ASSEMBLY -- These barstools are easy to move and assemble, no assembly required. Step outside with your friends or relatives and enjoy food and conversation with the Outdoor Wicker Bar Stool Set by ZENY Products!